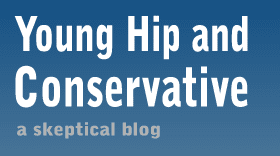 Young, Hip and Conservative: a skeptical blog: Is the left really opposing free speech? I'm having a difficult time confronting my own bias here, and I'm trying hard not to rest on sweeping conclusions that flatter my own political prejudices. I am trying not to conclude that a large section of the modern American left is opposed to freedom of speech because I keep seeing new examples pop up. The latest includes a feminist college professor and her students stealing an anti-abortion protesters sign, then justifying it because the sign upset her; calls to arrest people who deny climate change science; and yet another audience was denied the right to listen to a men's rights speaker because of activists drowning them out with noise. My inner skeptic is telling me to avoid reaching a conclusion here. I do not watch for right wing free speech opponents the same way and may be missing them in spades. The Gawker article on arresting climate change deniers is just some silly essay on the Internet about one single philosophy professor, and the dredging the comment sections of blogs is worse than idiot hunting, it's straight-up Kevin Drum's law. I know some people will assume I’m speaking to some sad fringe here. But I have been amazed at how mainstream these anti-free speech efforts have become. I have been amazed not just because of the immorality of trying to ban free though, free expression, and free assembly, or because these efforts reverse centuries of the assumed work of the left, but because of how easily this could backfire, in a world where our movements against sexism and racism and homophobia are still so fragile and contested. Left wing opposition to freedom of speech is not a regression to feudalism, where people could be arrested for saying things that were insulting or critical of those in power. Instead, it takes the form of sensitivity and trying to protect the downtrodden. It's not a step back, so much as a step in a foolish new direction. It would be so much easier to conclude that the American left has abandoned free speech, or that opposition to free speech is equally bipartisan, but I can't settle on either of those points. Instead I'm stuck in an intellectual limbo, wanting to drift to a conclusion but distrusting all the clues I see before me.